Searching difficulty: Finding that site is very difficult. 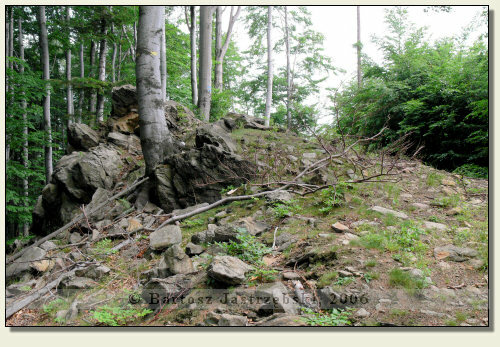 It is hidden in the forest, on the mountain and only one resident of Wolibórz knows that there was a castle. Access difficulty: Access to the castle is very atypical because Zamkowa Mountain is the only mountain familiar to me, up to which you hike… downhill! It since lies below the level of parking lot situated at the pass. For this reason the access to the post-castle site is easy, whereas the return is somewhat harder for you walk uphill all the way long. Driving from Nowa Ruda to Ząbkowice Śląskie down the road no 385 you go through Wolibórz. There you must turn left into the road no 384 for Bielawa, and then climb the pass along the hairpin road. At its peak you ought to drive past the parking lot and drive downwards. After covering around 1 km down the switchback, there will be the second parking lot on the right side. 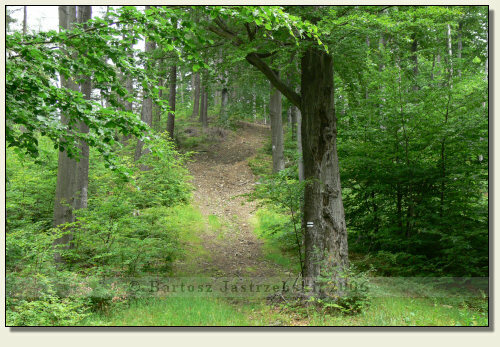 There you need to leave your car and walk down the forest path to the very right downhill (owners of high-suspension cars may reach the very foot of Zamkowa mountain). At certain moment a black trail joins a forest path, along which you have to go left at the third sharp turn of the forest path, uphill to the castle. 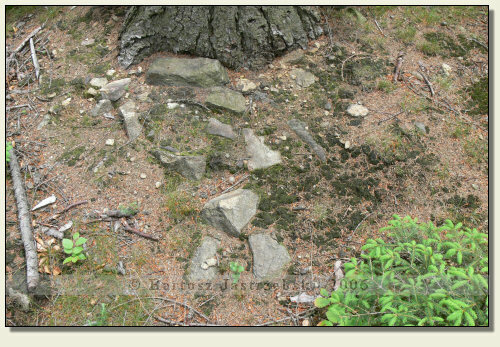 Time of access: to the summit – roughly 20 min., return – roughly 25 min. 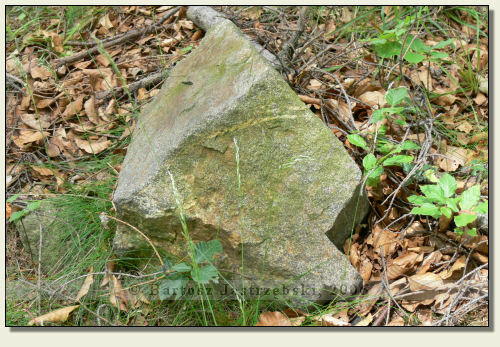 Gratefulness to the owner of Leśny Dwór in Wolibórz for indicating the post-castle site. Unknown history. The author is searching for information.